In an off-tangent study of the diminutive bones from Flores, Indonesia, it turns out that the hobbit had flat, clown-like feet which probably limited it’s walking range (other than it’s, say, really short gait). What does this find add to the current debate over whether the hobbit is an entirely new species or a deformed human? The foot had other peculiar features as well. For one, its big toe was quite short compared with the others, similar to earlier hominids such as Australopithecus. However, the shape of the toes, even the short big toe, is like modern human ones, Jungers says. “It has a human morphology and an ape-like proportion,” he says. 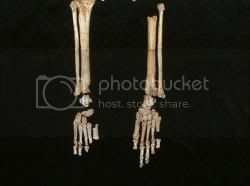 Jungers and other researchers who claim the hobbit was a distinct species from Homo sapiens point to the foot as further evidence supporting their theory. It has been suggested that the hobbit suffered from a severe block to growth known as cretinism or a disease called microcephaly that leads to miniaturised heads. And today there is a report from Australia that the hobbit had been to the dentist, probably in the 1930s.